Bangladesh’s agricultural sector contributes 14.2% of GDP, employing 47% of the working population, with 17 million people (1.4 million women) depending on fisheries sector for their livelihoods through fishing, farming, fish handling, and processing. Agricultural sector has experienced significant growth over the last couple of decades, with the fisheries sector following suit. According to the data from the Yearbook of Fisheries Statistics (2015-16), the current CAGR for the fisheries sector is 5.28% over the last 10 years. According to industry estimates, fish production will reach 5.02 million metric tonne within 2020-21. Despite shrinking water bodies for fish cultivation, sustained growth has been possible due to the use of better inputs and modern technology contributing to higher yield. Although the country has gained self-sufficiency in terms of agricultural production, the population is growing and will reach 185 million by 2030. To this end, there needs to be further increase in productivity to account for the growing population. Currently (2015-16) there are 14.7 million fish farmers in the country and 902 fish hatcheries (of which 136 are government owned and 813 are from the private sector). These hatcheries produce 618 Thousand Kg of juvenile fish. The inland (closed and open) fisheries and marine fisheries had a production volume of 4.13 million metric ton in 2016-17. 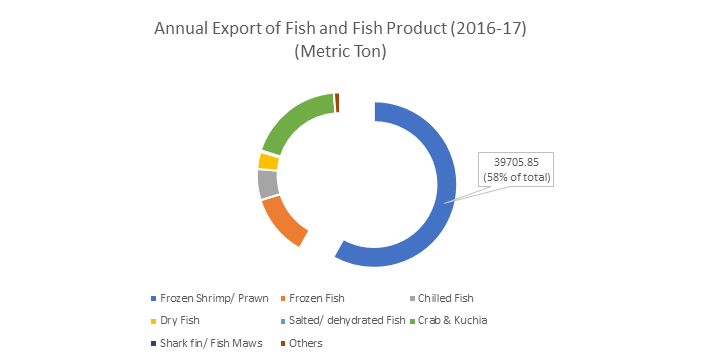 Additionally, the ongoing seventh Five-year Plan (from 2016-2020) of the government targets an increase of 45% from the baseline (FY2012-13) volume of 1.7 million metric ton cultured fish production. This will entail increased feed, medicine and equipment demand for the increased volume of fish. Using advanced production methods and commercial feed, fish production has increased over the years. With an increasing demand for fish protein and a decline in capture fisheries production, aquaculture is shifting towards intensification. This is reflected by the negative growth rate (seen in table 1) of extensive fish production method. As the industry is shifting from extensive to intensive production method, there will be more prevalence of disease requiring medicines and chemicals for supporting intensive fish farming methods. As a result, the need for advisory services in aquaculture and fish feed would markedly increase in the upcoming decade. The fisheries sector in Bangladesh has been earning a notable amount of foreign exchange. In 2013-14, the country earned BDT 4,776.92 core by exporting 77.33 thousand MT of fish and fisheries products. This is the highest export earnings in the last 10 years, starting from 2017. In FY 2016-17, the sector earned BDT 4,287.64 crore by exporting almost 68.31 thousand MT of fish and fisheries products. Shrimp is one of the major export items in Bangladesh. Total shrimp and prawn production including capture has increased from 1,60,000 MT in 2002-03 to 2,46,000 MT in 2016-17. The growing export can be attributed to the sector’s steps in ensuring HACCP procedure and traceability regulation according to the requirement of European Union (EU) and USA. The EU and USA accounts for 80% of the total shrimp export in 2015. Other shrimp export destinations include Belgium, UK, Netherlands, Germany, USA, China, France, Russian Federation, Japan and Saudi Arabia. The current volume of the annual fish feed market is around 7,00,000-8,00,000 lakh MT, while semi-industrial feed manufactured using simple mixing machine by local feed manufacturers, constitutes an estimated 5-6 Lakh MT of feed per month. The demand for fish feed (both sinking and floating) is projected to have a CAGR of 5-7% (Source: LightCastle Primary Research). As a riverine country, Bangladesh has a long history of producing and consuming fish, mainly sourced from the rivers. Over the last couple of decades, many of these rivers have dried up, and coupled with growing population, consumption of cultured fish has been on the rise. As the country becomes more prosperous, protein intake from fish based diet would get more precedence, mainly due to the perceived health benefits. Hence, the sustainable growth of the sector is of paramount importance for the economy. Dipa Sultana, Junior Associate at LightCastle Partners, has prepared the write-up. For further clarifications, contact here: [email protected].